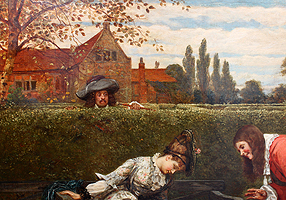 George Adolphus Storey (British, 1834-1919) A Very Fine and Large Oil on Canvas Titled "Love in a Maze". 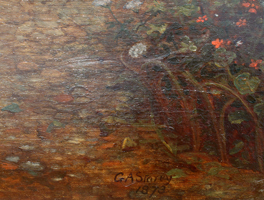 Signed and dated lower right "G. A. Storey 1873". 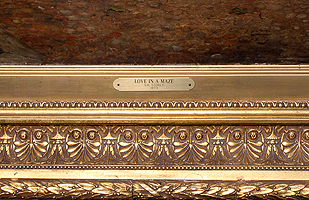 The reverse bearing the trade labels from Arthur Spencer, London that reads ""Love in a Maze by A. Storey R.A. Exhibited at the Royal Academy, 1873. Purchased by Thos Agneis of Bond Street - Christie's Rooms, on May 3, 1879 for £294" and another original label from "Tho's Agnew & Sons. - Manchester - London - Old Bond Street". Circa: London, 1873. 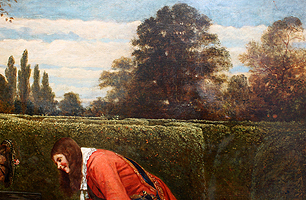 George Adolphus Storey (British, 1834-1919) A Very Fine and Large Oil on Canvas Titled "Love in a Maze". Signed and dated lower right "G. A. Storey 1873". 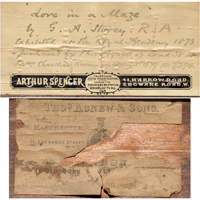 The reverse bearing the trade labels from Arthur Spencer, London that reads "Love in a Maze by A. Storey R.A. Exhibited at the Royal Academy, 1873. 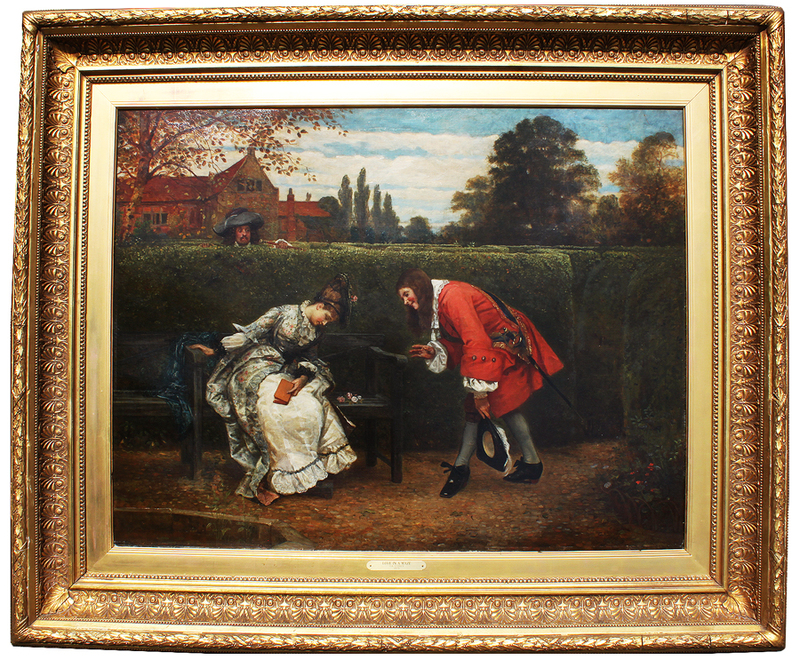 Purchased by Thos Agneis of Bond Street - Christie's Rooms, on May 3, 1879 for £294" and another original label from "Tho's Agnew & Sons. - Manchester - London - Old Bond Street". Circa: London, 1873. 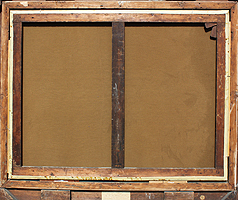 Frame depth 4 1/4 inches (10.8 cm). George Adolphus Storey RA (7 January 1834-29 July 1919) was an English portrait painter, genre painter and illustrator. Storey was born in London, but educated in Paris. When he returned to London, he worked briefly for an architect before studying under J. M. Leigh and J.L. Dulong. Though not a pupil he was also encouraged by William Behnes the sculptor, whose studio he visited. He exhibited at the Royal Academy from 1852 and studied at the Royal Academy schools from 1854. He was strongly incluenced by the Pre-Raphaelites but gave them up under influence of Charles Robert Leslie. 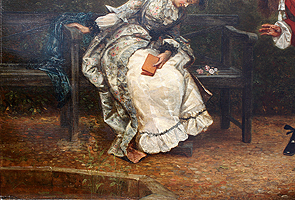 Storey worked in North London, establishing a reputation as a genre and portrait painter, and also as an illustrator. He drew elegant pictures of middle-class people for love stories and the like. Storey became ARA in 1875 and was a member of the Arts Club from 1874-95. 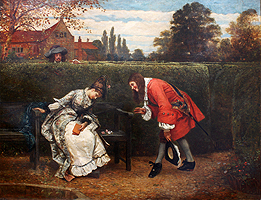 He exhibited at the British Institution, the Royal Society of British Artists in Suffolk Street and the New Watercolour Society. He also published his autobiography in 1899, containing valuable information about the St John's Wood Clique, of which he was a member until he moved to Hampstead. 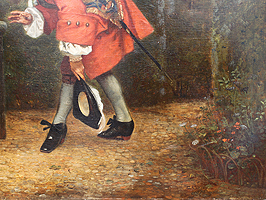 From 1900, he was also the Professor of Perspective at the Royal Academy, and became RA in 1914. Storey moved in the same artistic circles as James McNeill Whistler, with whom he was well acquainted. He also recalled being patted on head by Charles Dickens and became godfather to E. H. W. Meyerstein. (Source: Wikipedia).